It is important to not disregard stationery - this detail is just as important as flowers, food, and everything else that goes along with your wedding, since it is the first thing your guests see and will physically have as a keepsake. You should determine how much of your budget will be allocated to wedding stationery in advance and try your best to stay within that range. Ask your stationer for ways that you can save, in conjunction with the tips below. I personally offer a 10% discount on subsequent wedding orders after the first one is placed, to help my brides with their budget as they move forward and may have overspent in some other areas. Once you have made your list, find designs that you like and check the pricing to see if it fits in your budget. If your budget allows more, then start adding in the other items that may be important to you but not a necessity (envelope addressing, custom map cards, etc.). The most affordable printing method is digital, and allows you to have almost unlimited color options. Letterpress is beautiful, but it can run you about twice the cost of digital stationery for just one color. When it comes to paper, you will definitely get what you pay for. If you have chosen a design from a stationer and it seems cheap, it probably is. Paper that is purchased from craft or office supply stores is not used for wedding stationery, which is why it is important to use a stationer. A great design on cheap paper will not be worth it. Tip: Make sure that you order paper samples in advance to ensure you are getting high quality. Typically, you are looking for paper at a minimum of 110 lb. Most brides use a website for their wedding information, as it is the easiest way to update your guests on pertinent information. There are many free online wedding websites you can use, or if you have a little extra money (about $8-10/month) I highly recommend Squarespace so you can customize it to match your wedding materials. You will place your website information on your save the dates, and an insert card with your wedding invitations so your guests can view directions, accommodations, and other details. This will keep from purchasing too many insert cards and overwhelming your guests when they open your envelope (and save on postage!). Traditionally, if you are having a very formal wedding then you should have a reply card with an envelope. However, most weddings now are not overly formal; therefore, a huge cost savings could be using an online RSVP vs. a card with envelope. This not only saves you postage, but also with the cards themselves and generally ranges from $50-$150 in savings. A common error that is made is when couples order as little stationery as possible, because they are afraid of going over budget. I have had numerous clients come back to me and have to purchase more invitations because some were lost in the mail, or they needed to add people to their list, etc. This is a costly error, because stationers not only have minimums for reorders (they will not just print 2 more for you) but they are also charged at a higher rate for the low quantity. You should count how many addresses you are sending invites to, and then add 20%. I offer my invitations in sets of 10 vs. 25 to make it easier for my client's budget to get close to the 20% mark without having to overpay. It is much less expensive to add those extra 10 to your order up front than to order a higher minimum at later date. 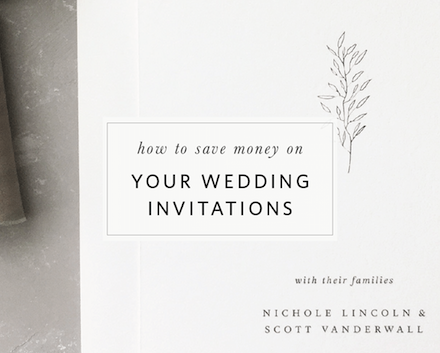 There are many questions that come across my desk regarding saving on wedding stationery, and how to save money. Below are a few things that should not be considered when thinking about your budget. DIYing all of your wedding stationery. If you DIY, it will look that way. Leave certain pieces to a stationer to keep the quality consistent, and possibly add your touches later if you are creative. Envelope liners, hand addressing envelopes and place cards, twine or ribbon, etc. can be done by you but leave the main pieces (save the dates, invitations, thank you cards, programs, etc.) up to a professional. Your stationery pieces are what your guests get to keep to remind them of your wedding day, so they should be special. There are affordable options for just about every budget! Placing RSVP information on the invitation. RSVP information should go on a separate card, either formally with an envelope or on an insert card requesting to RSVP online. Using postcards. I know that many on a budget think this is a cost savings, but it really isn't enough to justify the cost. I have had brides crying when they received the responses from their guests, because the post office damaged them so much. You should protect all of your stationery from damage and place it in an envelope (even save the dates). With envelopes, you are mailing for $.49/each; postcards are now at $.34/each. Even with a larger quantity of 100, you are only saving about $15 in postage and $20 in envelopes. Using postcard RSVP's are perfectly acceptable as long as you are not keeping the cards as keepsakes, as the post office has a tendency to damage them easily. Double Sided Printing. Your invitation and other cards should be kept to one side, and additional information on a separate insert card if needed. Having a patterned backer is fine for decoration, but you do not want to place pertinent details where they could easily be missed on the back. The one exception to this would be flat programs, as it is more obvious to turn it over to view the information. Hopefully these tips will assist you with your wedding planning!